The Bumbleride Indie stroller is a beautifully designed, versatile, all-terrain stroller that can be enjoyed by the baby as a new-born, right up through toddlerhood. There’s no doubting that its price is a little bit on the higher end. The good thing, however, is that this is an all-purpose and well-designed baby stroller that will not only save you money in the long run, but also save you the hassle of forever changing strollers, which may lead to untold inconveniences and unnecessary expense. The Indie’s appeal, is particularly derived from the designers’ consideration of everything a new parent would ever want in a stroller. It’s extremely easy to open and close thanks to its easy release trigger on the ergonomically designed handle, which allows parents to open and close the stroller in one simple and fast step. This comes in handy when you may have your hands full and need to close the stroller fast to load it in your car trunk. The Bumbleride Indie is tri-wheeled, with hardy air-pumped 12’’ wheels that can maneuver both indoor and outdoor, as well as smooth and rocky terrains. These wheels make it a perfect pick for an active family who love hiking in nature trails, taking a neighborhood walk in summer or winter or simply strolling by the beach. The front wheel has 360-degree swiveling action plus another really helpful feature that joggers want in a stroller: in-line lock option. This is a unique feature that allows you to lock the front wheel into the straight-ahead position. 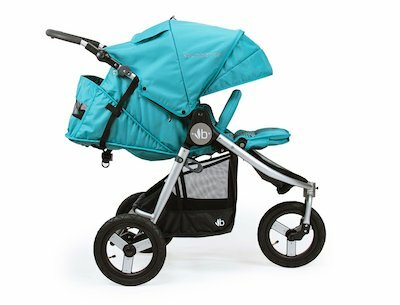 It makes the stroller more stable when running and jogging on non-paved surfaces by preventing it from veering dangerously in unplanned direction when at speed. Another good thing is that all wheels have suspension. This ultimately guarantees baby’s safety and comfort when off-roading since he/she won’t be rocked a lot. In addition, the handles are height adjustable from 26’’ all the way to 45.5’’ to accommodate both tall and short caregivers. The main seat features flat recline. This coupled with an adjustable leg rest, allows you to create a cozier space for the baby should you feel they need it. The seat converts to infant mode instantly, which means you can use this stroller as soon as your newborn is ready to go home from the hospital. Adjust the seating as the baby progresses into toddlerhood and until they hit the 55-pound weight limit. Something else that you’ll definitely love is that the Indie is compatible with a variety of car seats ranging from Britax, Graco, and Chicco to Nuna and Cybex, to name a few. Accounting for baby’s growth, and we all know how fast babies grow, the Indie now has an updated canopy with a good height to accommodate taller riders. The updated canopy is UPF 45+ rated in protecting your bundle of joy from UV radiation. This canopy has been crafted out of an eco-friendly canvas that is free of PVC, BPA, phthalates, and polyurethane foam to protect your little one from harmful chemical exposure. It easily extends and adjusts, allowing for more headroom and coverage, while maintaining proper ventilation and protecting baby from the sun’s harmful rays or the pouring rain, another of its most desirable and salient features. Storage is more than catered for. Although a parent/child tray would have been a huge plus, there are a couple of discreet pockets to allow you to store most of your small essentials at the back of the canopy. But what caught my eyes was its large storage basket that makes it very practical for shopping. In all honesty, you won’t need a shopping cart with this. There’s also a cup holder to keep your drink within reach. But as most previous users’ feedback confirms, it is flimsier than you’d expect on a stroller that costs what the Indie costs. What are other parents saying about the Indie? The Bumbleride Indie is relatively new and doesn’t have hundreds of reviews just yet. However, it seems to impress most of its current users with its functionality and ease of use. Its updated canopy that now offers more headroom for older kids is among the features that most parents highlight. Others also praise its 14.5’’ wide seat that can actually recline flat which is great for a newborn. Only a few parents found it to be heavy at 24 pounds. It also loses some marks with the fact that it requires both hands to close. More stroller reviews you can find on my blog. ← Black Friday 2018 – Where To Find The Best Deals For Baby Products?